Protekt Aire 4000 Alternating/Low Air Loss Mattress System 8". Includes mattress mattress cover and motor. The Protekt™ Aire 4000 is the 1st defense for facilities to treat pressure ulcers stages I-IV. The high volume user friendly pump combines low air loss and alternating pressure in one unit. The air flow and pressure range can be customized according to each individual patient's weight. The "static" mode provides firm support for easy patient transfer. 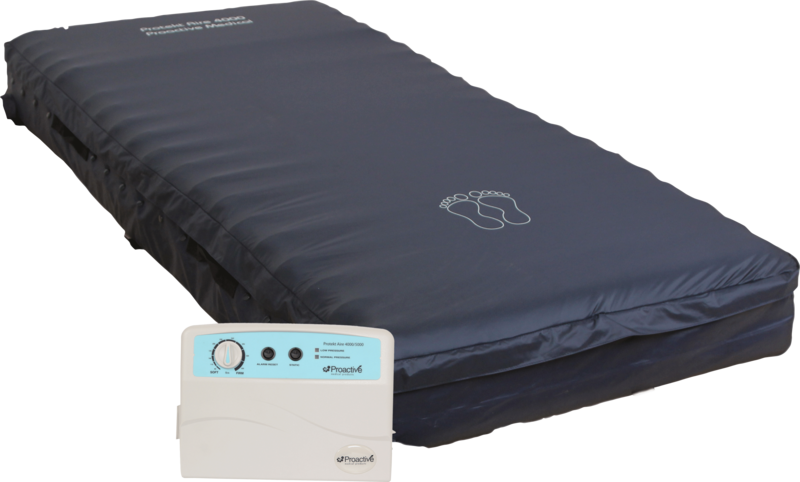 The mattress is comprised of (20) 8" air bladders that allow for deep immersion and excellent pressure redistribution. The top cover is quilted for added patient comfort. Removable, water resistant, non-shear, antimicrobial nylon cover is quilted for extra comfort. High flow pump with 8 liters of air per minute. Adjustable comfort settings allows pressure to be customized according to each patients therapeutic requirements.